The most universally recognizable symbol of Christianity is the cross of Jesus Christ. For believers it represents the love of God, a love that would not even spare heaven's most precious treasure. For most of those outside the faith it represents an absurdity, and for the Jews, a blasphemy. No other doctrine of Christianity divides believers from unbelievers like the cross of Christ. There is a story that well illustrates this point, albeit with humor. A woman bought a set of audio cassettes for her young son. dramatizing the life of Christ. He was fascinated by the person of Jesus, his life, his miracles, and so on. But when the tape started to describe Jesus' crucifixion, the boy became very upset. He crossed his arms, stuck out his lower lip, and pouted. His mother happened to walk into the room at this time and noticed how upset her son was. She asked him what was wrong and he said, "I don't like what they did to Jesus, nailing him to that cross." His mother explained to him that by dying on the cross Jesus could forgive all of his sins and give him eternal life. Undaunted, he said, "I still don't see why they couldn't have just glued him on!" The Apostle Paul said it so very well in 1 Corinthians 1:18, "For the preaching of the cross is foolishness to those who are perishing, but to us who are being saved it is the power of God." (1) The cross is at the heart of the biblical message, and Evangelicals have championed the theologia crucis, the theology of the cross, ever since Martin Luther. Like the boy in this story, most people are offended, confused, outraged, at the idea of a crucified Savior. Christians have traditionally believed that Jesus' death on the cross was predestined as the original plan of God. No, it was not! It was a grievous error to crucify Jesus Christ. The crucifixion of Jesus was the consequence of the sheer ignorance of the people of Israel concerning God's dispensation. God's will was clearly for the chosen people to accept and believe in Jesus (Jn. 6:29, 10:37, 38) and receive salvation (3). What the UC presents is a way of salvation independent of the death of Christ upon the cross. Also, the UC believes it stands in relation to the Christian Church in the same way as the first Christians stood in relation to Judaism. They have a radical message that is unacceptable to theological orthodoxy, one that does not include the commonly understood meaning of salvation. It is their heartfelt belief that they are the fulfillment of New Testament Christianity in the same way Christianity was of Judaism. However, as their full name implies, they are the Holy Spirit Association for the Unification of World Christianity. Nothing less than the unification of all Christian Churches (and all religions, economics, politics, science, etc.) is their goal. An important step in this direction is the wooing of the Evangelical branch of Protestant Christianity. Part of their strategy for accomplishing this goal has been to sponsor several conferences in Japan and Korea under the auspices of the Interdenominational Conferences for Clergy. My wife and I attended one of these conferences in February of 1988. We had the opportunity to discuss Unification theology with some of their church leaders and theologians, which sparked my interest in doing research on the cross in Unification theology. While in Korea we also had a chance to discuss the relationship of the UC and Evangelicalism over coffee with Richard Quebedeaux, who has been organizing conferences such as the one we attended for over ten years. Quebedeaux writes that the UC likes these conferences with Evangelicals because, "it's a real intellectual dialogue between two groups of people who think that theology isn't just important, it's of ultimate seriousness." (4) This common ground offers hope that we can, indeed, engage in meaningful dialogue. It will be helpful to focus on this point briefly. Rev. 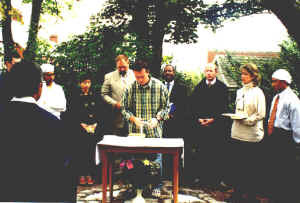 Moon believes that by uniting all faiths, politics, etc., the world will be able to defeat the three great enemies of the human race now in existence, namely: increasing immorality (expressed as extreme self-centered love), disunity between nations, races, cultures, and religions, and atheistic communism. The end of such unity and its victory will be nothing less than the Kingdom of God on earth (8). People like myself are eager to work to hold the Unification movement within the Christian tradition and to strengthen that attachment. Other people, by attacking the [Unification] Church, are trying to push it outside in a sectarian way. It seems to me that theologians play, especially in respect to this movement, a very important formative role in determining the future of the Unification Church in relation to Christian tradition (11). 1) This and all subsequent Scripture quotations are taken from the New International Version of the Holy Bible (NIV). 2) The Unification Church's first missionary, Young Oon Kim, arrived in 1959, and the Church was formally incorporated in California by September 1961. 3) [Chung Hwan Kwak]. Outline of the Principle, Level 4 (New York: Holy Spirit Association for the Unification of World Christianity, 1980), 79. Referred to as L4 hereafter. I have been criticized for, with whatever notoriety I have, legitimizing Unification. All I can say about legitimacy is that every person is created in the image of God and is legitimate. Unificationists are so legitimate that Christ died for them. 5) Richard Quebedeaux and Rodney Sawatsky, eds., Evangelical-Unification Dialogue, Conference Series no. 3 (New York: The Rose of Sharon Press, 1979). 346. 6) Richard Quebedeaux, "Under the Umbrella: The Reverend Sun Mvung Moon's Goal and Strategv for the Unification of Christianity and Other World Religions" in The Future Of The World, ed. Andrew Wilson (New York: International Cultural Foundation and International Religious Foundation, 1987). 64-67. 10) Quebedeaux in Bryant and Foster, Hermeneutics, 73. 11) Ibid., 77. Unificationist Joe Tully, said in 1980 that "most of Unification thought is in formative stages of development. " Darrol Bryant, ed. Proceedings Of The Virgin Islands' Seminar on Unification Theology, Conference Series no. 6 (New York: The Rose of Sharon Press. 1980), 145. If this is true, then as Evangelicals we should be looking for ways to be a part of this process by sharing our faith and our hearts with them. 12) See Divine Principle (New York: Holy Spirit Association for the Unification of World Christianity, 1973), 9, 147-149, 210 212. Referred to as DP hereafter.